As some of you may know, last Saturday my family celebrated the 11th Annual Practice Thanksgiving. I wish I could tell you some amazing story about how such a holiday came about but the details are lost in the fog of history. I know that it was eleven years ago in our house in Phoenix. It was two years before Husband and I got married and six years before we had our first child. Husband was working and I was going to college and working part time. One hot Arizona fall day, I realized that I had no idea how to cook a turkey and that someday I would probably have to host a Thanksgiving. My parents were visiting from Washington and it seemed like the perfect opportunity to practice. 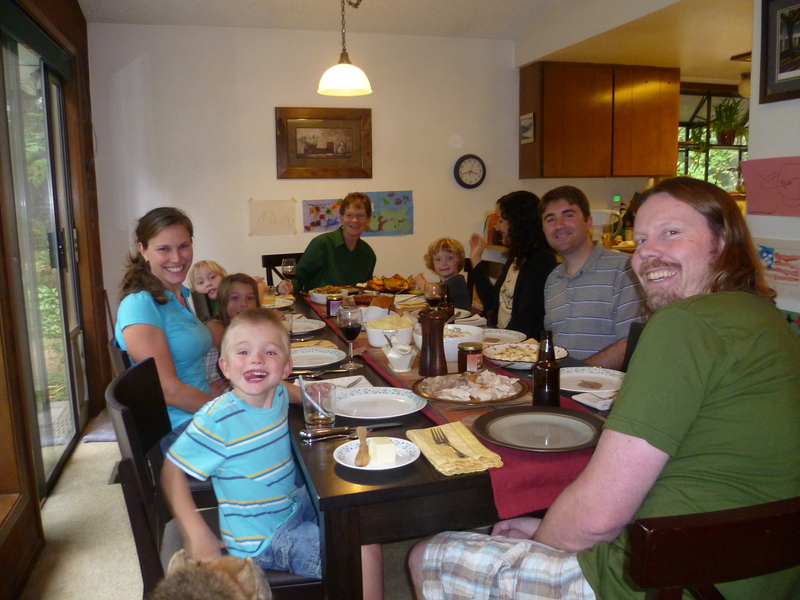 We invited family and friends and prepared an entire Thanksgiving meal for practice. 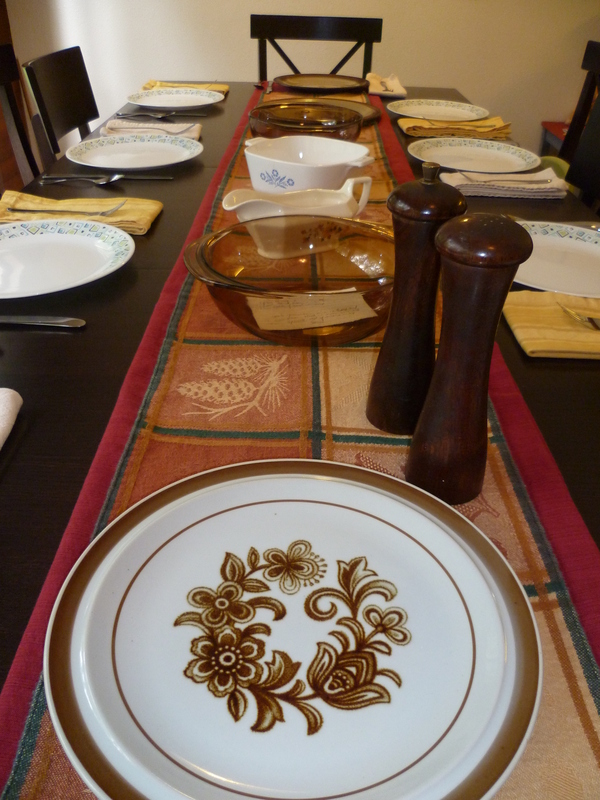 And so began the tradition we now think of simply as Practice Thanksgiving. To make sure I have enough serving dishes, I set out what I have and place the recipe card for each item in its' corresponding bowl. Practice Thanksgiving is a holiday of convenience. It is a floating holiday which tends to fall around late September or early to mid October. I first call my parents and a couple of close friends and find out what day would work best for them. Then I invite others; people I have met over the past year or people I have wanted to invite but for some reason or another have not. Our house is small and I always over invite so sometimes it gets crazy. Usually someone has to cancel at the last minute, which used to freak me out but does not anymore. The most we ever had around our tables (yes that is plural) was sixteen. That year we had to bring in the lawn chairs to accommodate the group all gathered around three tables. Carter helping me clean the table before we set it. The menu stays pretty much the same from year to year (except for that one year when I decided to shake it up and serve grilled cedar plank salmon instead of turkey). On the table you will find a large turkey stuffed with homemade stuffing. Mashed potatoes with gravy made from the turkey drippings, fresh cranberry sauce (frozen berries if the fresh are not yet in season), green bean casserole, homemade rolls, deviled eggs, wine, and at least two kinds of pie, are served. Sweet potatoes are usually made but somehow were neglected this year. Sometimes we get fancy and bust out a jar of pickled asparagus. The year of the picked asparagus was also the year we had to use our green plastic lawn chairs so I guess it was not that fancy. 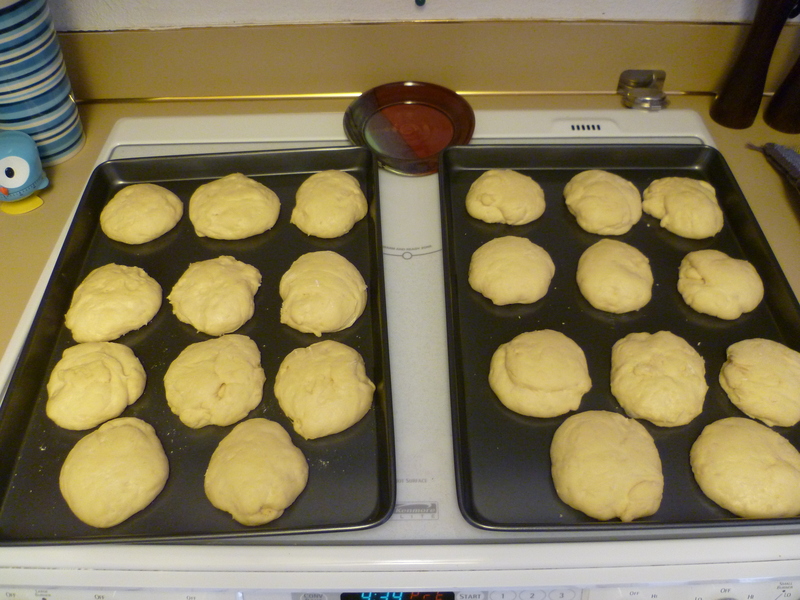 My homemade rolls waiting for the oven to preheat. 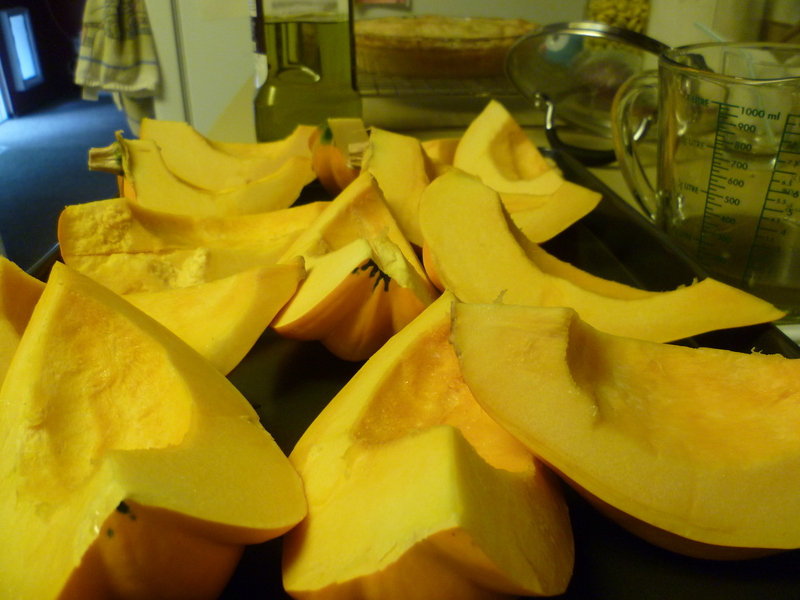 The acorn squash was wonderful grilled with butter and a hint of brown sugar. 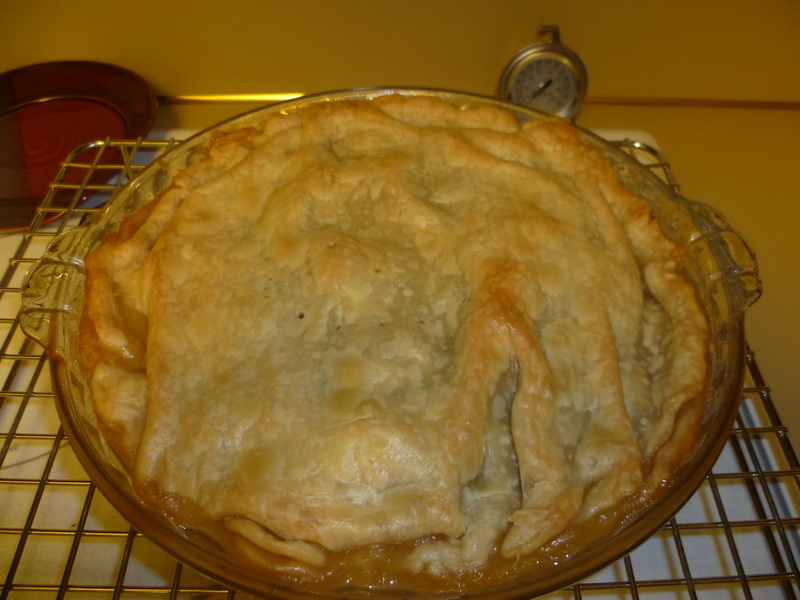 Anyone want a slice of apple pie? Over the years I have learned a lot by asking questions and getting plenty of help. And I have learned to embrace the chaos of hosting a dinner party. My mom usually brings the rolls but this year she could not leave dad alone so I made them and we talked on the phone. Our friend Amy usually brings the cranberries and helps with the making of the gravy but her son had a soccer game and they had to miss the feast. My mother-in-law did a great job with the gravy this year, grilled some amazing acorn squash and I learned how to make the cranberries. Our friend Diana and her twin five-year olds came for the first time and brought a delicious ambrosia salad. Our friends Christine and Chris make a fantastic pumpkin pie from scratch. On the fifth year they were living out of state but managed to attend anyway. The following year they moved about an hour drive from us. I would like to think it was the delicious meal that inspired their move but perhaps there were other forces at work too. Friends and family around the table before eating. The four kids played so well together. 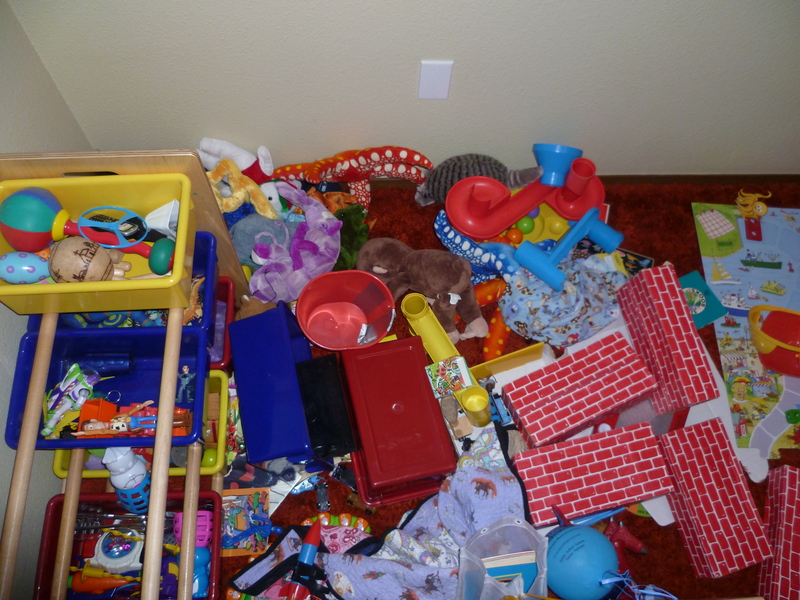 They made a bit of a mess in Cody's room but they also spend lots of time outside riding bikes and jumping on the trampoline. After the fifth year, I started taking notes and writing down tips to help me for future ones. It is fun to look back on them and see what the menu and guest list looks like. It is always a bit different from year to year. Something will inevitably go wrong and if you accept that and learn to flow with it you will be ok. Practice Thanksgiving is a lot like life in that respect. 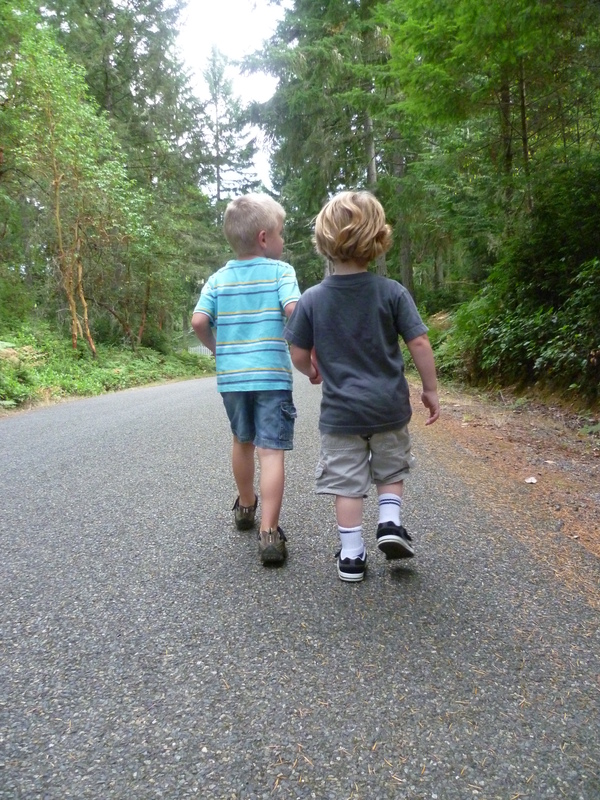 Carter holding hands with his friend on our traditional after dinner but before pie walk in the neighborhood. Oh, by the way, I have yet to host an actual Thanksgiving but with all this practice I just might be ready. 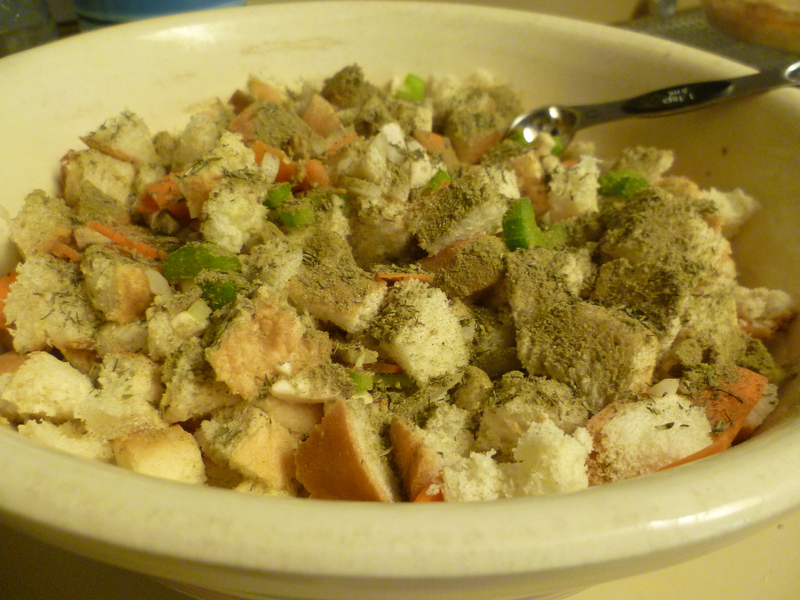 This entry was posted in Food Glorious Food, Random Thoughts and tagged Cranberry sauce, Green bean casserole, Pies, Practice Thanksgiving, Pumpkin pie, Turkey. Bookmark the permalink. What an awesome tradition! I love it!Looks like so much fun! I love how the tradition came to be. 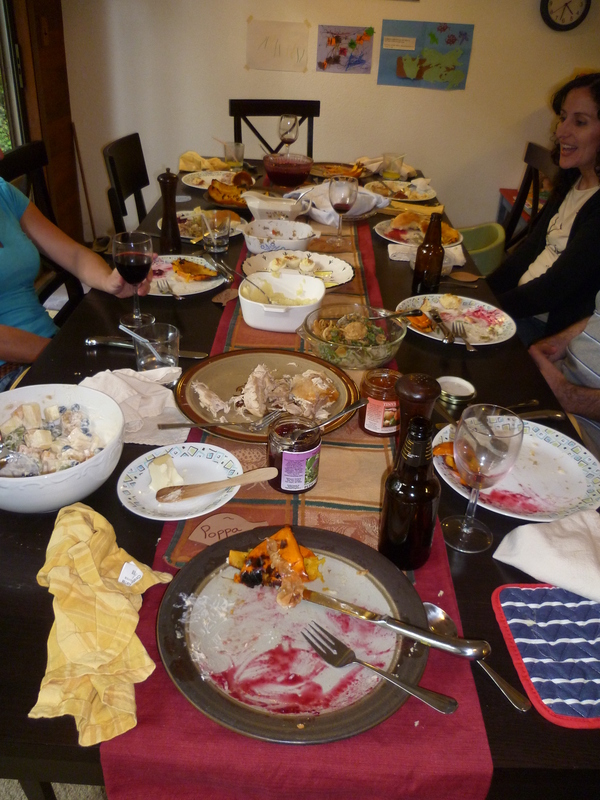 I have never had a Thanksgiving dinner where I haven’t had more than one table. 🙂 Some holidays we sit around the fancy eatin’ table but most holidays I can manage with the dining room table and a smaller card table. Sounds like you have a great family!